Alan Kernaghan following Glentoran's 3-2 defeat by Annagh United. Kernaghan offered his resignation after the League Cup exit. Pic by PressEye Ltd.
Alan Kernaghan stepped down as Glentoran manager late last night in the aftermath of the top-flight club’s shock JBE League Cup exit to Annagh United. The 3-2 defeat away to the NIFL Championship’s basement club increased the pressure on Kernaghan, with growing unrest from within the Glens fanbase following a knockout blow just four days after a 4-1 league loss to Coleraine. 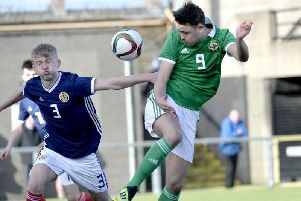 The former Republic of Ireland international held discussions with Glentoran officials at Annagh’s Tandragee Road following the final whistle, with a club statement released to confirm his decision. Kernaghan was appointed manager at The Oval last November and a stuttering start to the Danske Bank Premiership campaign left Kernaghan in the spotlight following just two wins from six league fixtures before the loss to struggling Annagh. Goals by Jaime Gardiner, Jordan Campbell and Steven Park secured the memorable 3-2 win for Annagh. Ciaran Caldwell and a first goal in Glens colours for former Glasgow Rangers star Nacho Novo proved little consolation.